There is little reason to worry that the new technology will create large-scale unemployment. The steady stream of improvements in driverless cars has convinced me that before too long the roads will be filled with cars and trucks operating without humans at the wheel. Likewise, I am convinced that the revolution in artificial intelligence will allow computers and robots to do many of the tasks that white-collar workers now do. It’s not surprising, therefore, that many people are worried about the fate of those whose jobs are vulnerable – or have already been lost – to the latest disruptive technology. What will happen to the millions of men and women who now drive trucks and taxis when the trucks and taxis can drive themselves? What will happen to the accountants and health workers when computers can do their jobs? Some analysts have estimated that, with many fewer employees needed to produce the current volume of goods and services, a large share of current employment could be made redundant. I hear these worries and realize that they cannot be easily dismissed. But I am optimistic that the United States, at least, will adapt successfully to the new technology. There may be some losers as well as winners, but the American public as a whole will be better off. And those who lose their jobs to the new technology will soon find other employment. I believe that there is little reason to worry that the new technology will create large-scale unemployment. The changes in technology will increase the economy’s output and raise the potential standard of living of the population. Those who want to work will continue to find jobs. Why am I so optimistic? Simply put: history. Rapid technical change is not something new. We have experienced technological change that substitutes machines and computers for individual workers for many years. And yet, despite the ups and downs of the business cycle, the US economy continues to return to full employment. This has been most dramatic in manufacturing. Robots and automated machines have replaced production workers in manufacturing for many years, driving employment in the sector from 13 million in 1950 to only nine million now, even as the real value of manufacturing output rose by 75%. And those who are no longer employed in manufacturing have found jobs elsewhere in the economy. Computers have also replaced workers in a wide range of service industries. We no longer see many elevator operators. Switchboard operators are gone. Most of us get our boarding passes at airports from automated check-in machines. Law firms and accounting firms use computers to do what professional employees used to do. And yet the US unemployment rate is now just 4.9%, even lower than its average in recent decades. 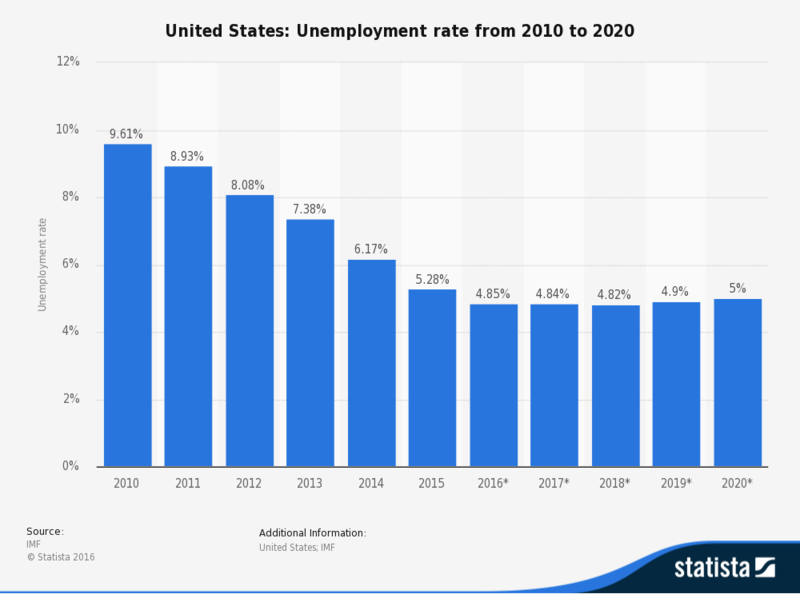 Among US college graduates – who constitute 40% of the US labor force – the unemployment rate is just 2.7%. Because college graduates comprise a larger share of the younger age cohorts than of the older population, the overall unemployment rate will be held down as that group ages and its share of the labor force grows. The rising output per worker made possible by the increased use of robots and computers also will allow employees to work fewer hours and enjoy more leisure. Employees in the US currently work an average of 1,790 hours a year, 30% more than their German counterparts, who average just 1,371 hours per year. A reduction in working hours per employee translates into quality-of-life improvements like longer vacations and longer weekends. Fewer working hours will also provide more opportunities for travel, eating out, and other activities that create jobs for service workers. The aging of the population will increase the need for service-sector employees in hospitals and nursing homes as well. These trends will fuel higher demand for workers in the service sector, which now accounts for 81% of employment in the US. The share of workers in the US service sector increases year after year; it is where those who lose jobs in manufacturing or construction find new ones. And computers and robots simply cannot replace many of these jobs. Although they can provide some of the services that older people will increasingly need, for example, they cannot provide the services that involve actually touching clients and patients. People choosing careers will bear such considerations in mind as they select occupations. That, too, will hold down the unemployment rate in the future. The US unemployment rate currently is less than half the rate in the European Union. There are many reasons for the disparity; but a critical one is the absence in the US of labor laws and union rules that prevent employees and firms from adapting to the new technologies. If the US maintains a relatively free labor market, employees will adjust positively to the changing technology.